How does what appears to be “the perfect family” go from infallible to divided it 3 seconds? Try catching your brother making out with the girl who broke your heart not more than 30 minutes earlier. Oh yeah, and also have the entire rest of your family watching. Steve Carell is about the only guy you could still root for after getting into that predicament. 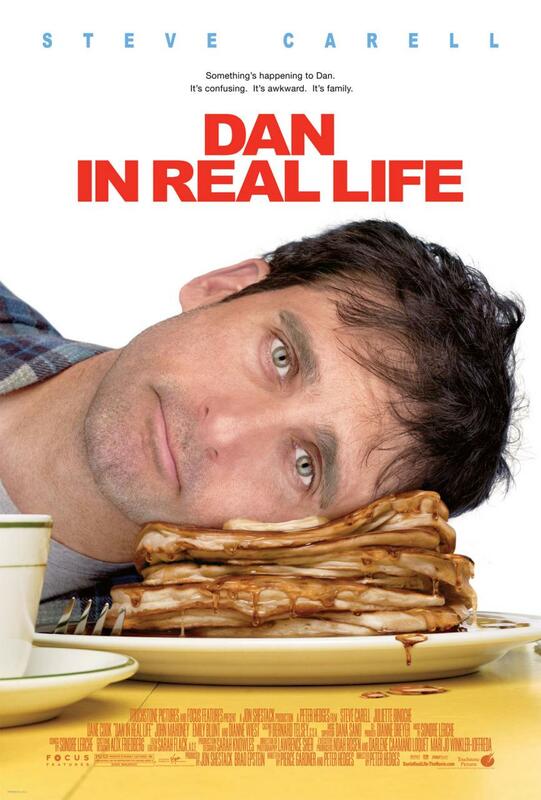 Dan in Real Life is one of the more clever romantic comedies to come out in quite some time. It avoids the overly sappy angle and yet still has you feeling for not only the obvious fool that’s lost-in-love, but the rest of the parties involved as well. Steve Carell is money as Dan Burns, a newspaper advice columnist who has been very effective in teaching people above love and family, yet hasn’t quite become the master of his own domain. He struggles in the single father role to three young girls who essentially want nothing to do with him, all for their own reasons. I am sure most dads with girls in any of these situations cringed when they watched as he was shunned one by one. It’s as if Carell took Brick Tamland’s theory on love (I love lamp) and morphed it with Michael Scott’s idiotic dry humor and took a pinch of Andy Stitzer’s naivety to put up one of his best performances. I can’t help but to start taking this guy seriously as a legitimately good actor. A damn good one in fact. On his annual trip to the family’s lake house, he meets a woman who catches his eye, intellect, and his heart from the outset. This is a big deal for Dan who has not yet been able to cope with his feelings of loss after the death of his wife four years earlier and has yet to learn to love again. He has been so immersed in raising his three girls that he forgets about his own needs most of the time. The difference here is that this woman makes him remember those feelings he hasn’t had in a long time. Juliette Binochet is excellent as the object of Dan’s affection. The big problem is that Dan’s brother is already attached to the lovely Marie (Binochet). Dane Cook actually manages to surprise me in this film and pulls off a nice job as Dan’s meathead-goofball of a brother. If you have ever heard Cook’s standup routine than you can clearly see why I was surprised. His “routine” translated over to the big screen nicely, but it’s a big letdown if you are sitting in the audience at one of his road shows hoping to laugh at some legitimate comedy. Good thing Carell is there the whole time to bring him along and keep him in line. Dan’s family provides much of the comedic levity needed to keep this movie from turning into just another wannabe tear-jerker that gives guys that nauseous feeling. They do a great job of convincing us that they are that “perfect” big family while still being real and full of idiosyncrasies like all familes. Sometimes it is easy to be annoyed by characters that are seemingly and nauseatingly “perfect.” In this case, the layers underneath reveal themselves quickly and you find yourself closer to them and with more in common than you ever would have imagined. There are a few Meet the Parents/Wedding Crashers – type moments that had me laughing out loud, mostly because they were unexpected in this type of film. I would have no qualms recommending this movie to guys or gals who will each take something different from it… finally a movie that “gets it” and refuses to toe the line of Hollywood cheesiness. Marty Barasco: Love is not a feeling, Mr. Burns. It’s an ability. Dan Burns: I don’t want to go out with the pig… face. Dan Burns: Put it on my tab. Marie: You don’t have to smile. Dan Burns: It’s better than the alternative.